Yesterday shortly after going outside in Jiangmen, I saw more red silk-cotton flowers. 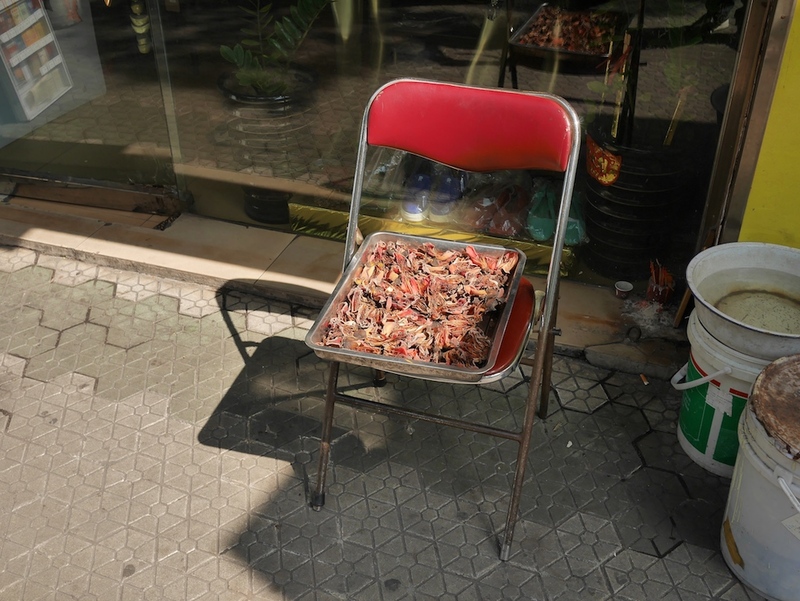 These, though, were being dried in the sun. 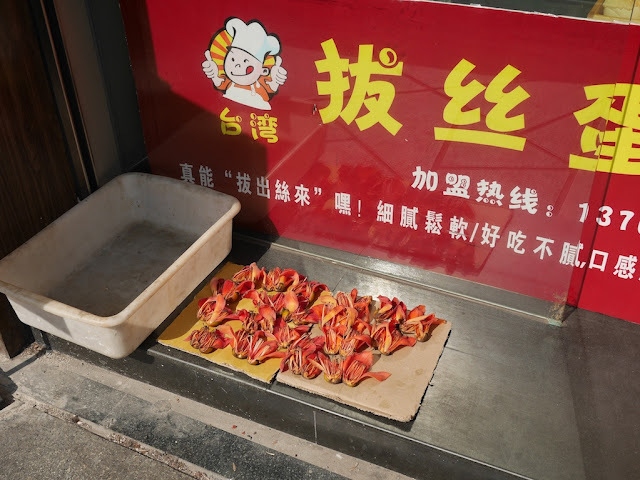 Around the corner from there, more red silk-cotton flowers were drying. Possibly some people are planning to use them to make herbal tea. The flowers are also used for soup and congee. Next door, another item was sun drying. 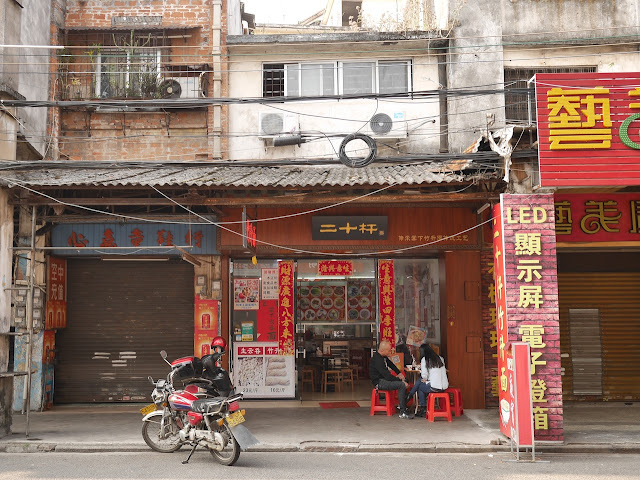 Xinhui, a nearby district in Jiangmen, is known for its dried tangerine peel, used in a variety of foods, soups, and teas. 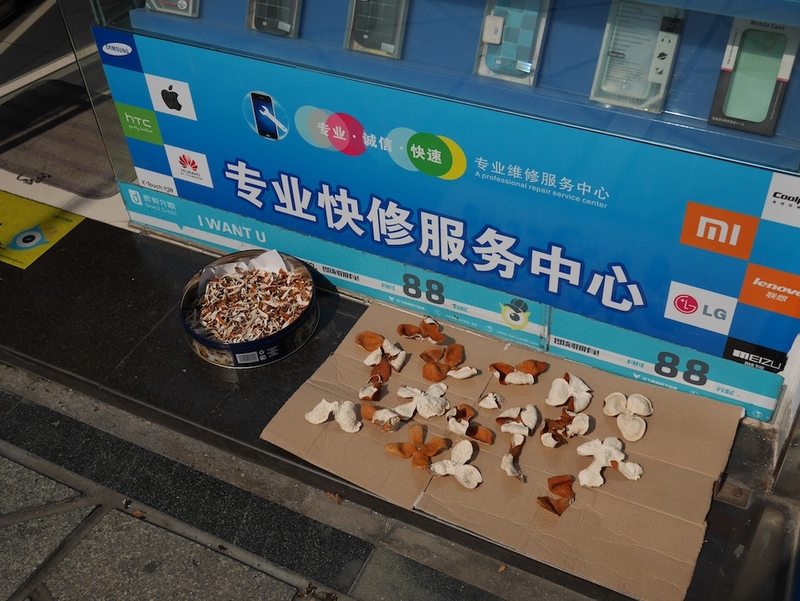 So it wasn't surprising to see these tangerine peels on the ground, even outside a mobile phone repair shop. I saw these three examples of drying during a brief outing which didn't cover a lot of ground. 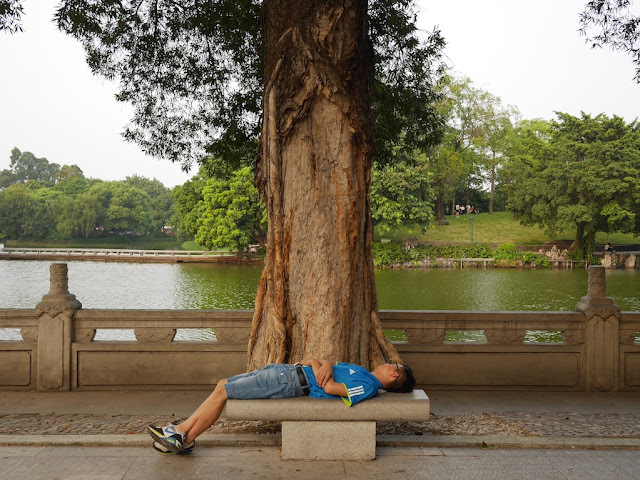 Undoubtedly, more could have found on that sunny day in Jiangmen. Perhaps the girl had already finished her food. During the Lunar New Year holiday in China many restaurants close and many red signs with messages of good luck appear. Some places remain open, though, or reopen before the end of the holiday period. And the eating goes on . . . I stumbled upon the above small place, Èrshí Gǎn (二十杆), on Taiping Road in Jiangmen yesterday. 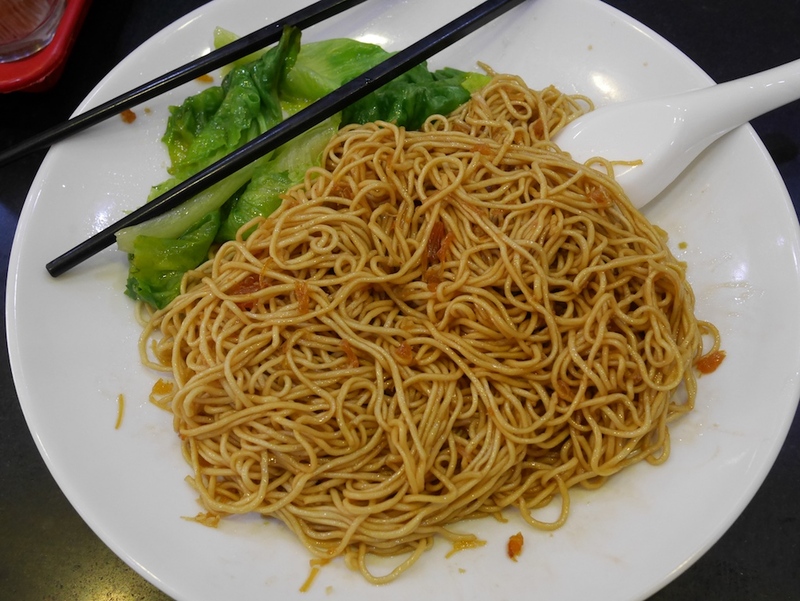 The XO sauce lo mein (XO酱捞面) was recommended, so I gave it try. The noodles might not look like anything special, but they were rather flavorful and quite satisfying — perfect fuel for a game of xiangqi. I didn't try their chicken, partly because I had already eaten river eel with onions, ginseng chicken soup, and a gua bao at other vendors around the Huaxi Street Night Market in Taipei. But if I order it someday, I plan to heed their strong recommendation. Admittedly, the building's design, which significantly differs from the other buildings around it, is what catches my eye when I have walked by in the past. Also admittedly, I have not taken advantage of any of the offerings now there. 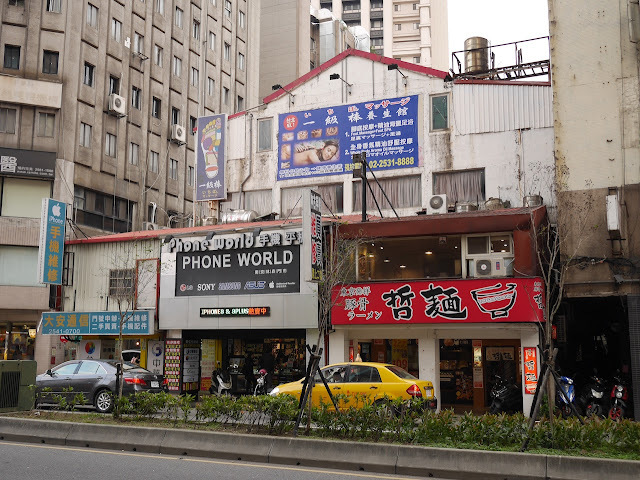 Over six years ago I wrote about some similarities in Taiwanese and Italian food culture. Today in Taipei I saw a promotion reminding me of that post. More soon. I'm definitely eating well, though I don't now have anything special to report about perfumes. What's the Sichuan Pepper Frequency, Kenneth? 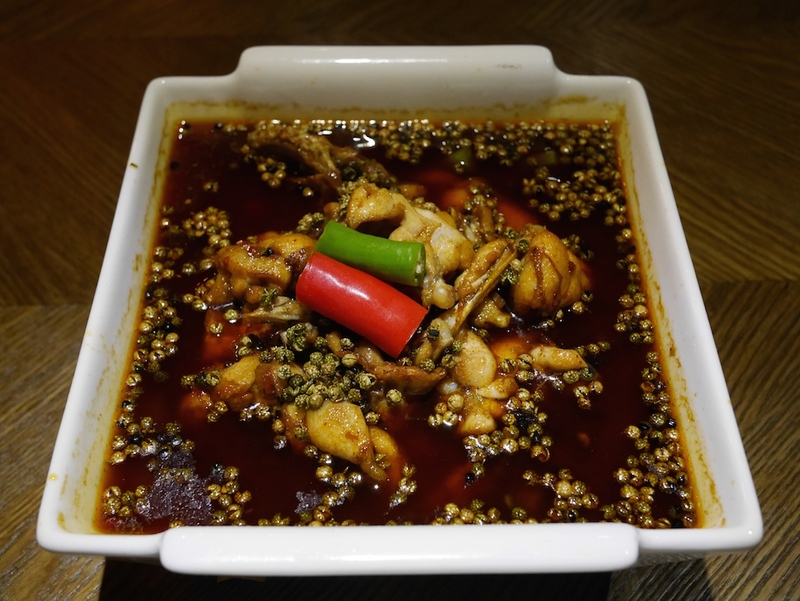 Even more than other spices, endowed by evolution with defensive odors and tastes, Sichuan pepper seems designed not to be eaten. Once you get past the thorns, the taste of a fresh or freshly dried berry leaves your mouth, tongue, and lips buzzing and numb for several minutes. It is literally electric: The active ingredient, sanshool, causes a vibration on the lips measured at 50 hertz, the same frequency as the power grid in most parts of the world, according to a 2013 study at University College London. Basically, this is because hertz is simply a measure of the number of cycles per second and there's nothing special about the measurement of 50 hertz on its own. For example, on a standardly tuned piano tuned there is a key for the musical note G (Contra octave) which will produce a sound at 48.9994 hertz. In this case, the hertz measurement reflects the fundamental frequency of that note. If you wanted, you could retune the piano so that the key produced a sound at 50 hertz. In either case the note isn't any more electric or Sichuan peppery than the other notes on the piano, even if it's an electric piano. Similarly, 50 hertz electrical grids aren't literally the musical note G.
For another example, a strobe light could be set to flicker at 50 hertz. Again, this wouldn't be any more electric than if it flickered slower or faster. And countries such as the U.S., Canada, and Guatemala have electrical grids with a frequency of 60 hertz. Is Sichuan pepper less electric there? 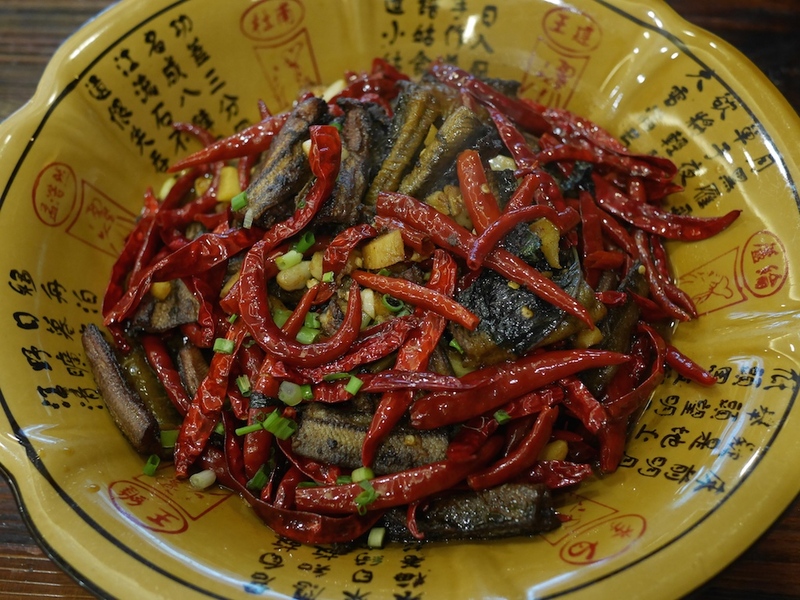 So enjoy some Sichuan peppers. But unless you're also sticking your finger in an electric outlet while grounded (note: do not do this) or something similar, the experience won't be literally electric because of the exact frequency of the vibrations. The buzz is grand nonetheless. Additional note: For those who don't understand the reference to Kenneth, see here. I didn't have any rats running up my leg like I did in Changsha five years ago, but Thanksgiving this year was still a success. Although a holiday-special pulled turkey breast burger with cranberry BBQ sauce took way too long to arrive at lunch, the delay led to a free slice of dark chocolate cake (thank you, Sunny). The cake was more impressive than the burger, so it felt like a net win. For dinner I chose a Western upscale hotel with a buffet that I figured would be serving turkey today. Not only was I correct, but I arrived in time to score a leg. It took a little extra effort to communicate that, yes, I really wanted the whole leg. Early bird scores the worm and all that. 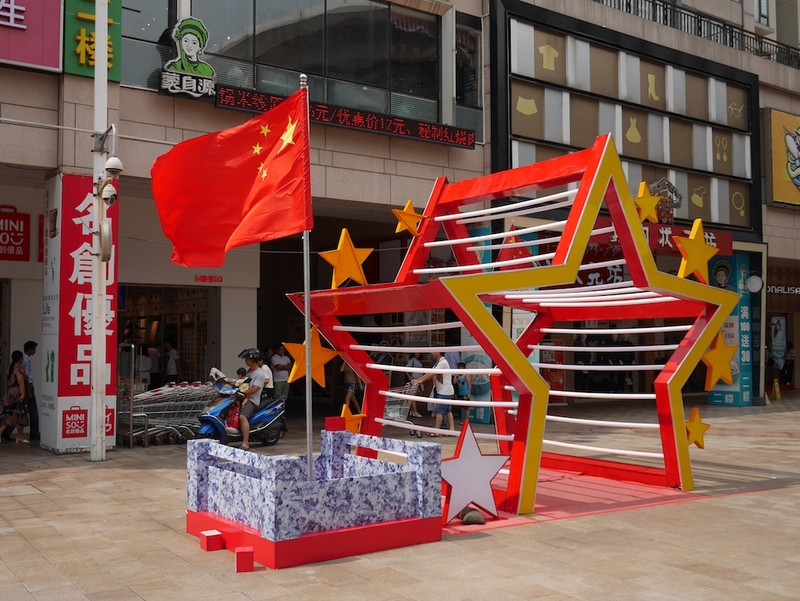 Today at the Dasin Metro-Mall (大信新都汇) in Zhongshan there were patriotic signs of the ongoing National Day holiday. 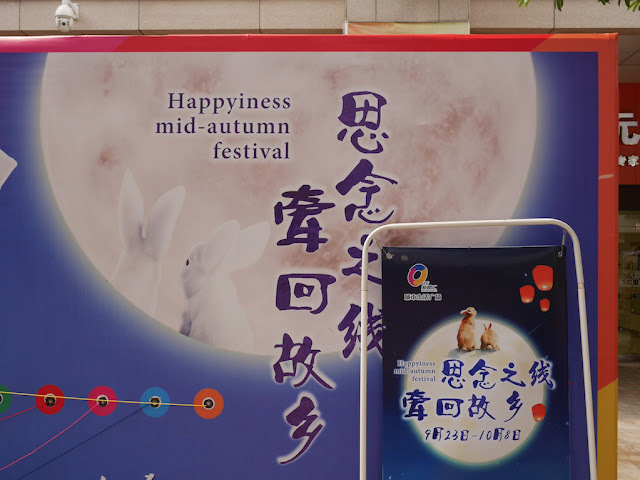 Today is also the Mid-Autumn Festival. 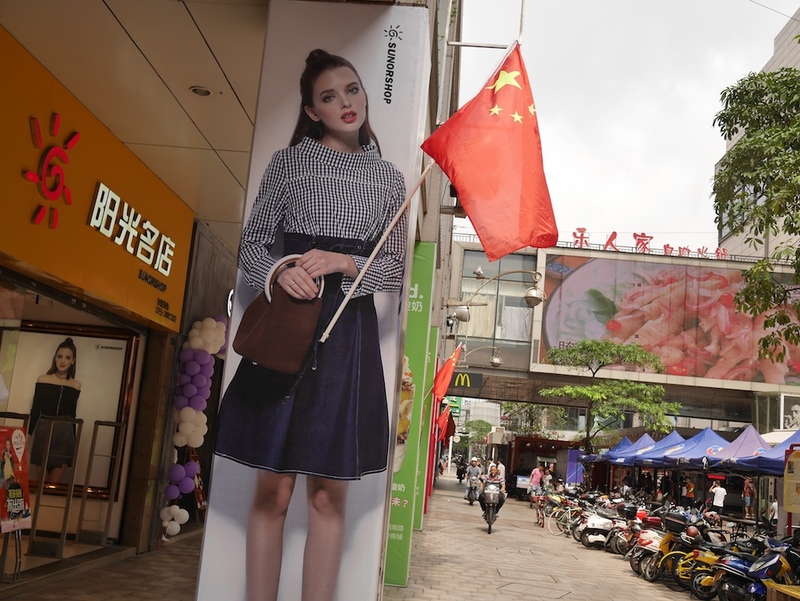 Like elsewhere in Zhongshan, the conjunction of holidays apparently inspired some "Buy One Get One Free" sales at the mall. Perhaps because of the overlap, I noticed just one sign which only mentioned today's holiday. Mooncakes are a popular feature of the Mid-Autumn Festival. Unlike last year, this year I have no sightings of Hello Kitty mooncakes or mooncakes for dogs & cats to share. 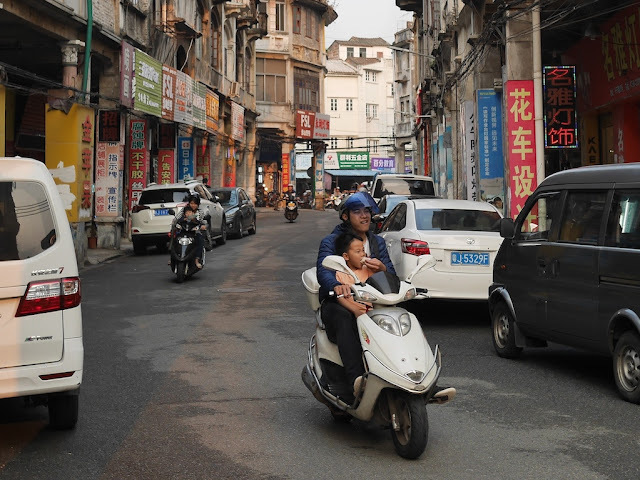 I saw both of those in Macau, so maybe a short trip would have fixed that. 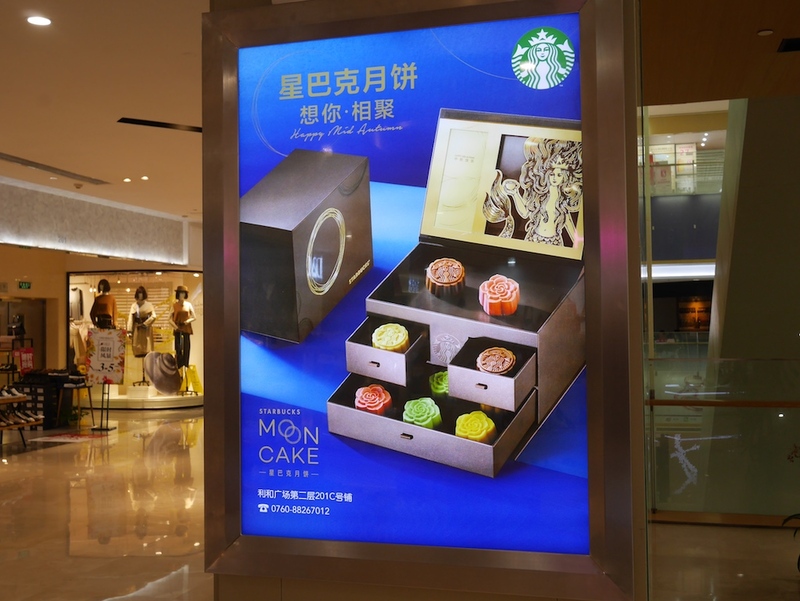 A single Starbucks mooncake costs 59 yuan (which at the moment equals U.S. $8.88 — how lucky). A barista pointed out it came in a fancy box which looks like a lantern. It isn't hard to find even pricier mooncakes for sale in China. Or you could go somewhere like Walmart and buy tiny mooncakes for about 2 yuan (about U.S. 30 cents) each. 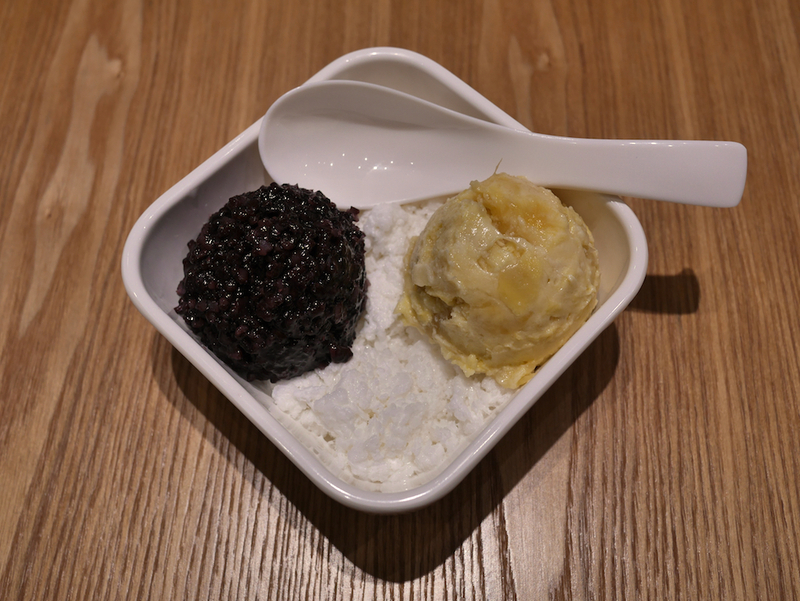 The ones with black sesame filling and salted egg yolk aren't bad. And to those who will be celebrating a new year, Shanah Tovah. On a recent sunny day in Guiyang, some people sold fruit along a road leading to an entrance to Qianling Mountain Park. One woman sold mangos and mangosteens. Despite their similar names in English, the two fruits look very different, taste very different, and aren't closely related. Their names aren't at all similar in Mandarin Chinese. Still, the pairing caught my attention. 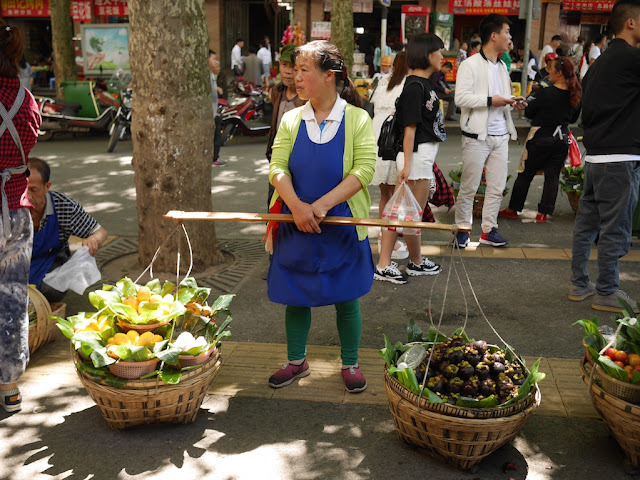 After taking a few photos, a man behind me got my attention and expressed amusement over my interest in the fruit seller. 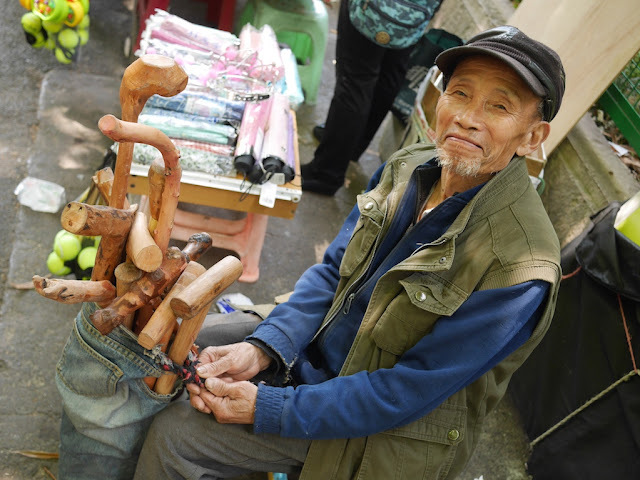 He also opportunistically asked if I was interested in buying one of the wood canes he was selling. I wasn't, although I knew one could soon come in handy for defensive purposes. After a brief friendly chat, the man was happy when I asked to take his photo. I then decided to buy some mangosteens from the woman. After the bargaining was over — mangosteens aren't cheap — I had three promising-looking purple orbs. I gave one of the mangosteens to the man. He initially refused but soon cheerfully accepted the fruit. Mangosteens are really good. I attached the clear plastic bag holding the two remaining mangosteens to my camera bag and headed into the park. After checking out a zoo in the park, I cracked open one of the mangosteens. I wanted to make sure I enjoyed it before it was possibly stolen. Already there had been several attempts — some involving direct confrontations and others involving stealthier strategies. I had expected this since the fruit were so clearly visible. 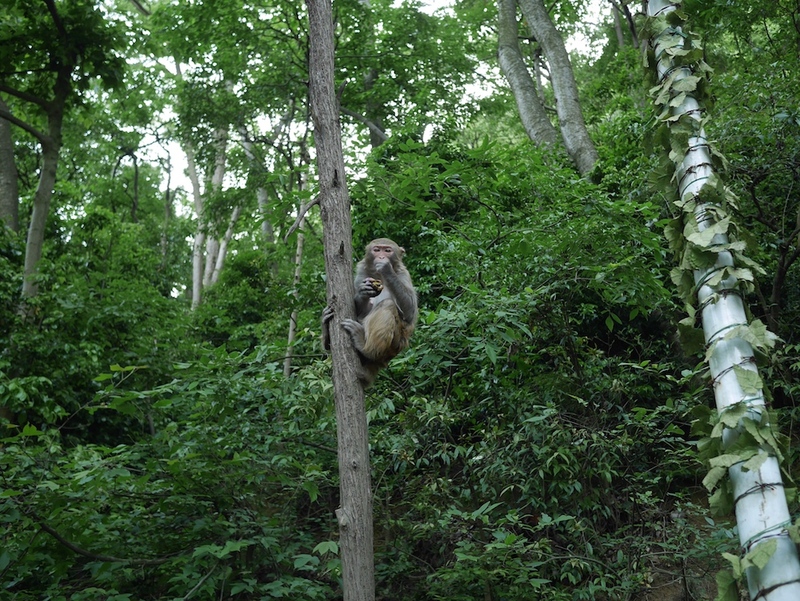 One needs to be aware of such things when roaming around Qianling Mountain Park. Then just when all seemed clear I felt a very strong pull on my camera bag. As people yelled, I spun around reacting as quickly as I could. I knew a mangosteen was at stake here. It was all a blur, but at the end I had maintained possession of my camera bag despite the strap somehow disconnecting. And to my surprise the plastic bag remained attached as well. The culprit quickly fled to a tree for safety. From there the monkey looked at me . . . Looked at me while eating its prize. 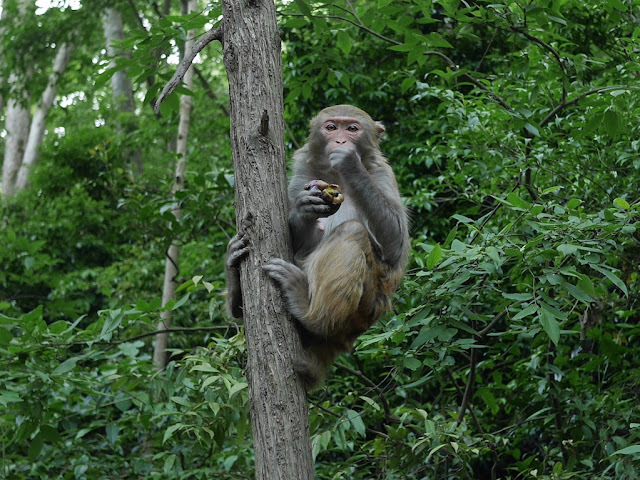 Well done, monkey. You succeeded where many had failed. And your reward was a glorious mangosteen. 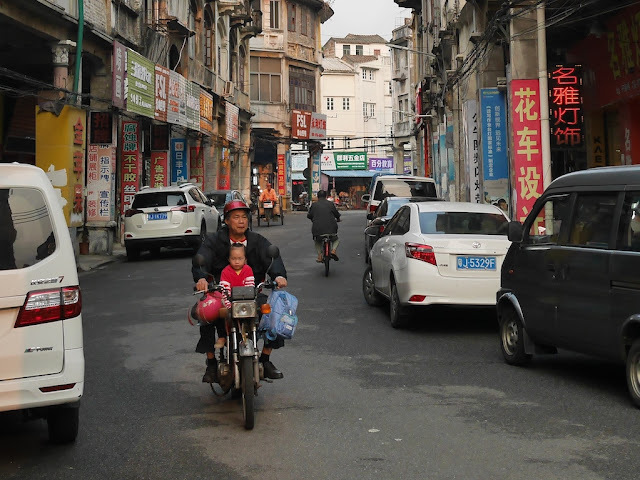 Towards the end of last week I hailed a taxi and told the driver I needed to go to the Hengyang East Railway Station. He asked for 40 yuan (about U.S. $5.80). I felt confident 40 yuan was too high, but I wasn't sure what to target for bargaining. I just told him to use the meter. He clearly didn't like that idea, so I prepared to get out of the taxi. He turned on the meter. 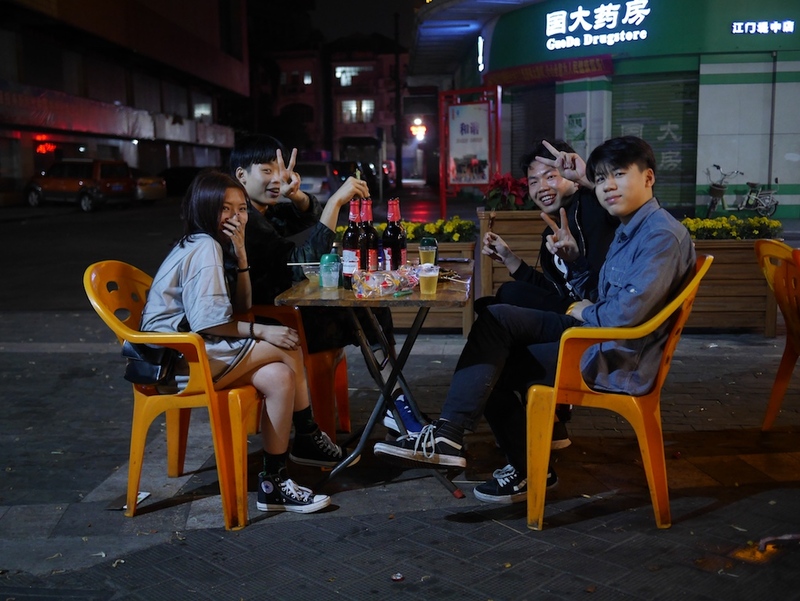 The fare turned out to be 27 yuan. I hadn't had time to eat much that day, and I hoped to grab something at the station. 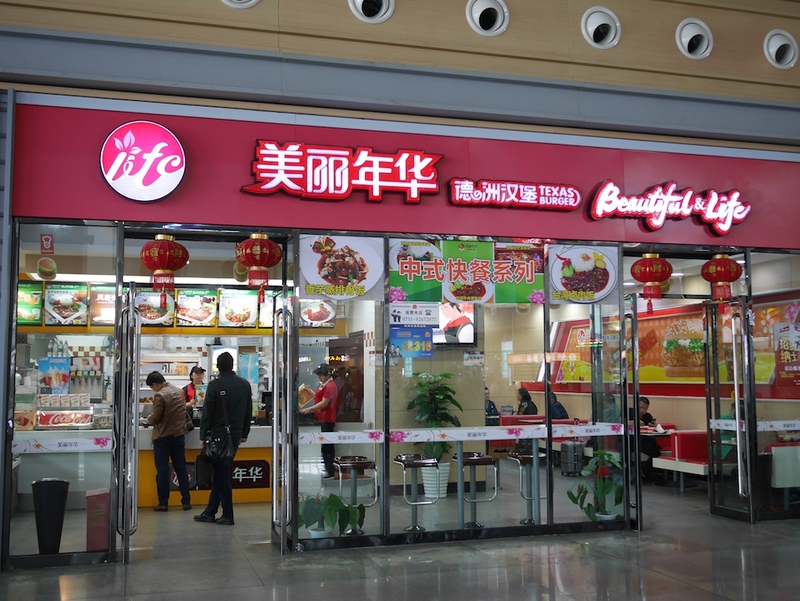 I suspected the options were minimal and the McDonald's there would be my best bet despite my fondness for Hengyang's local dishes. But I worried I wouldn't be able to go down to the arrivals level, order food, and then return to the departures level to go through the ID check and security in time for boarding. So I went straight into ticketed-area of the station and hoped to find something there. 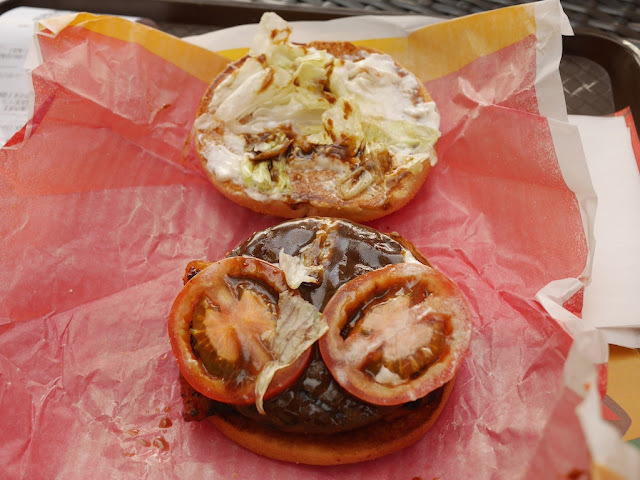 Once inside, I saw something I expected — a lack of a McDonald's — and I saw something I hadn't expected — Texas Burger. 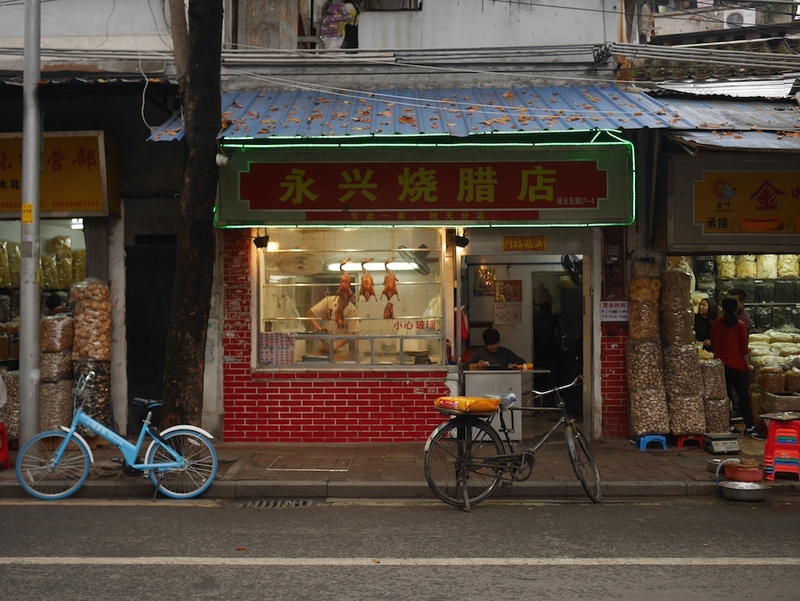 I hadn't recently seen any of the once common New Orleans roasted chicken vendors in Hengyang. I figured it was now time for some not-quite-Texas fare in Hengyang. I quickly scanned the menu and didn't see anything named a Texas Burger, so I ordered a burger which looked like a Big Mac. I didn't go for the full meal. The burger I soon received looked far more compressed than the one displayed in the menu. And the taste . 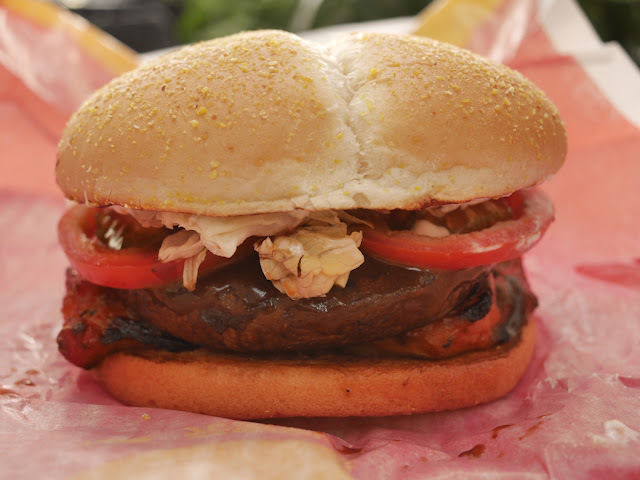 . . well, the patty made me think of an overcooked old high school cafeteria-style burger. It definitely didn't make me think of anything I had ever eaten in Texas. Without a doubt, I would take New Orleans roasted chicken over that any day. But at least I wasn't hungry anymore. 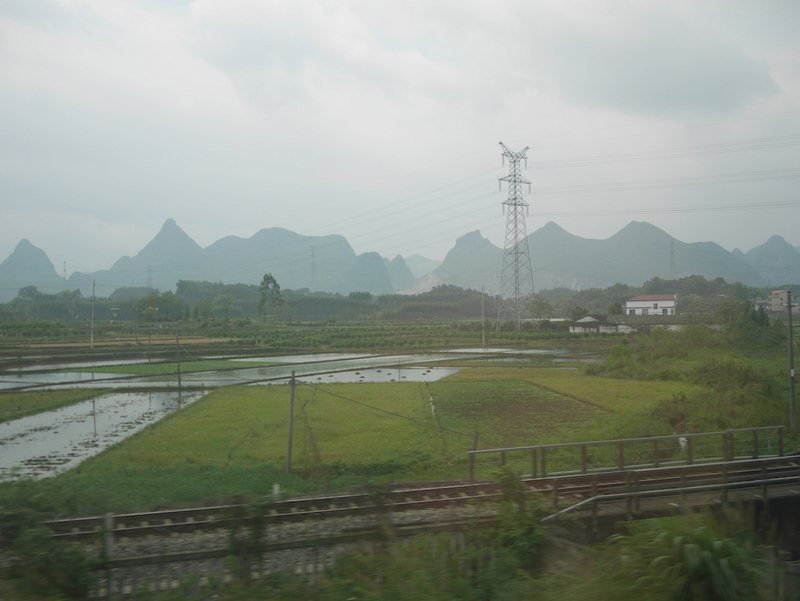 And soon I departed Hengyang on a train route I had never traveled before. This meant I could enjoy some new views and attempt to photograph them through a dirty window while moving at about 200 kilometers per hour. 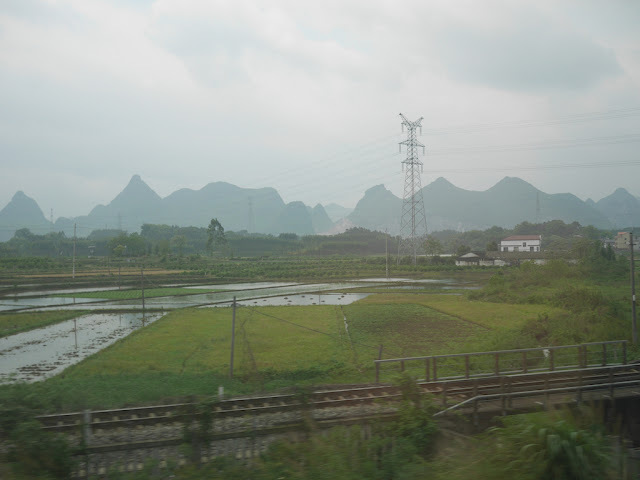 In about 2 hours and 40 minutes I arrived at my destination 342 kilometers (213 miles) from the station in Hengyang. Not bad for 100 yuan (U.S. $14.50). My first view of the city from high up included a McDonald's but no Texas Burgers. 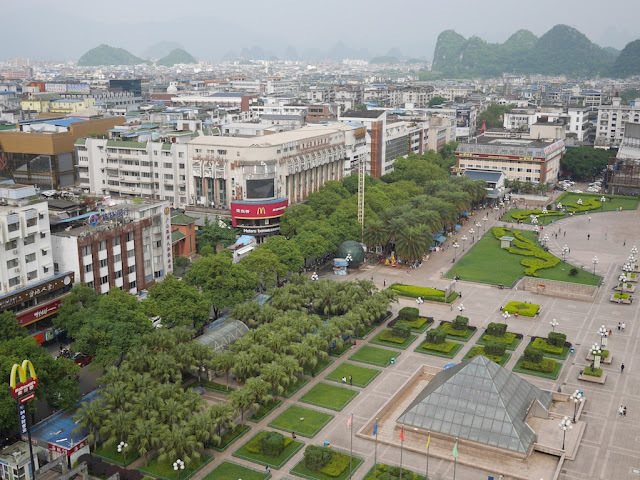 The city is more well known than Hengyang and popular with tourists, though, no, the glass pyramid in the photo isn't the entrance to the Louvre. For those familiar with China, this is a relatively easy one to figure out. Guesses welcome. Let me know if you want some Texas Burger as a prize. I haven't received any correct guesses of the city captured in the previous photo. So for another clue — one which significantly narrows the possibilities —I will share a photo of a local-style dish I enjoyed in the same city the other day for lunch. On this note, with the exception of occasional forays into non-Chinese foods, I mostly eat local-style dishes wherever I happen to be in China. Unintentionally, it has been a while since I have been in any regions known for spicy foods. As can be pretty clearly seen in this photo, I have now rectified this issue. Those peppers had a solid kick. And the eel was good too. 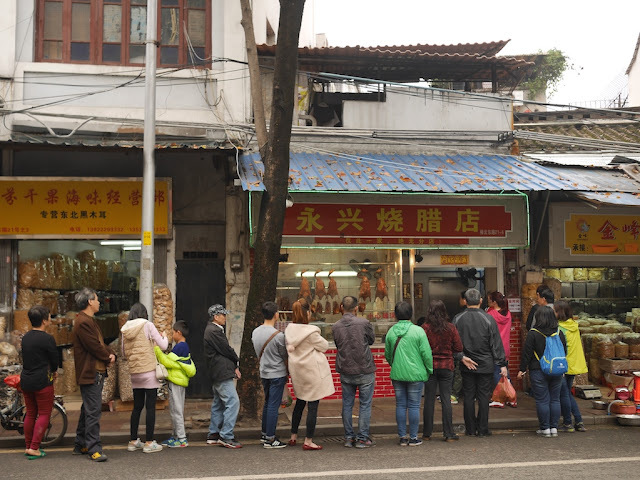 If you stumble upon the right place on Tiyun East Road in Guangzhou, you may notice a long line on Sunday around 4:30 p.m. 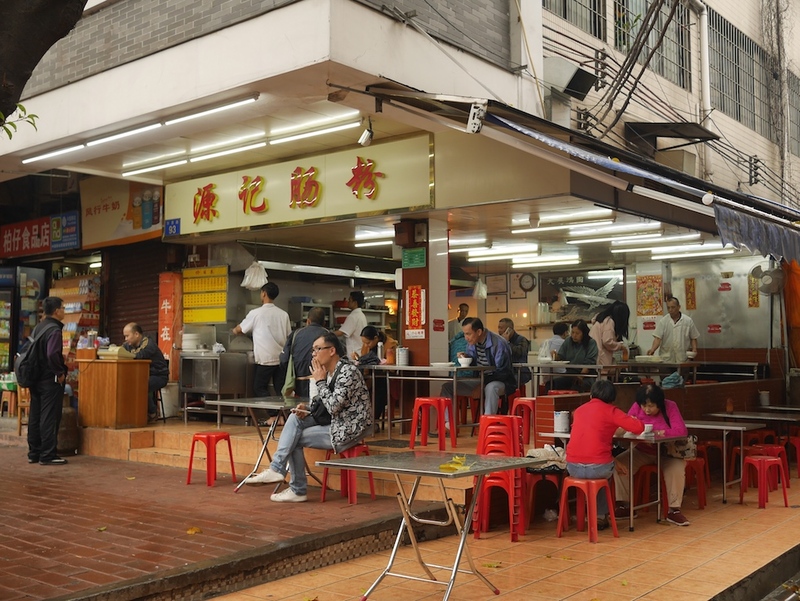 The people are patiently waiting to order take-away Cantonese-style barbecue. The name of the place is straightforward enough in Chinese characters — 永兴烧腊店. The name in English could be Yongxing Roasted Meats Shop or Wing Hing Roasted Meats Shop. The former is based on Mandarin, standard for China, and the latter is based on Cantonese, the local dialect. Whatever you want to call the shop, it deserves a closer look. 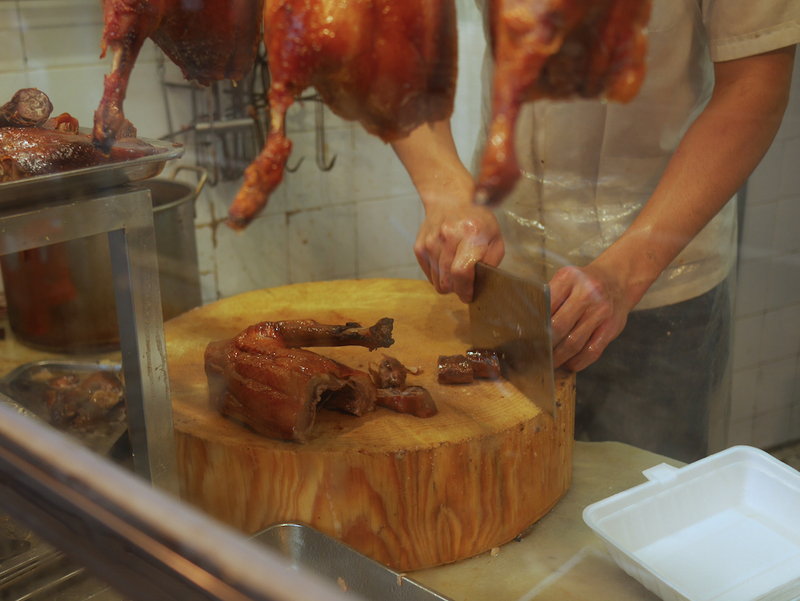 If you like goose meat, you may be tempted by the hanging geese. If you like pork or chicken you could still be in luck. If you don't like meat, you may be interested in observing, but you'll be out of luck in terms of eating. And if you like goose meat but don't like to wait, you will be even more tempted when there is no line, possibly around 5:30 p.m. on a Sunday. The options have decreased but about three and one quarter geese remain hanging. A quarter of a goose may be too much for one person, or even two. 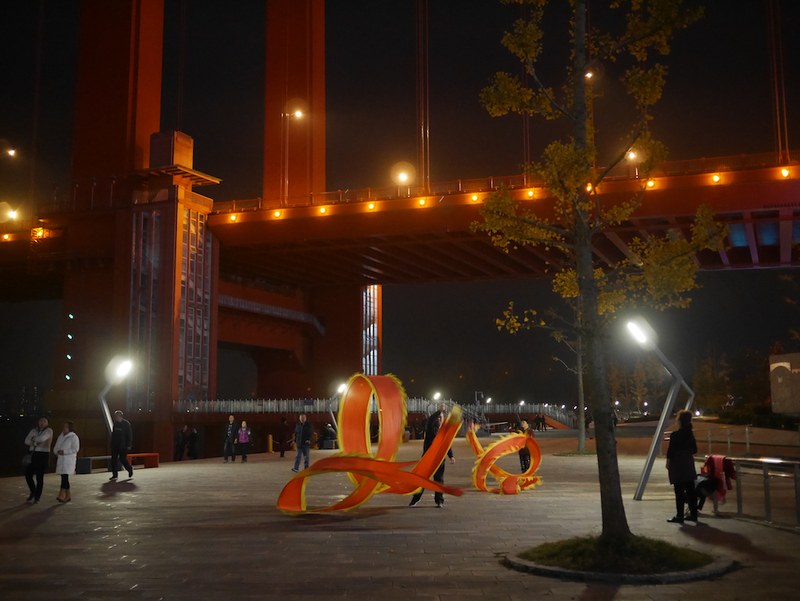 But that may not stop you from inquiring about how much it costs, since the place emits such a promising vibe. 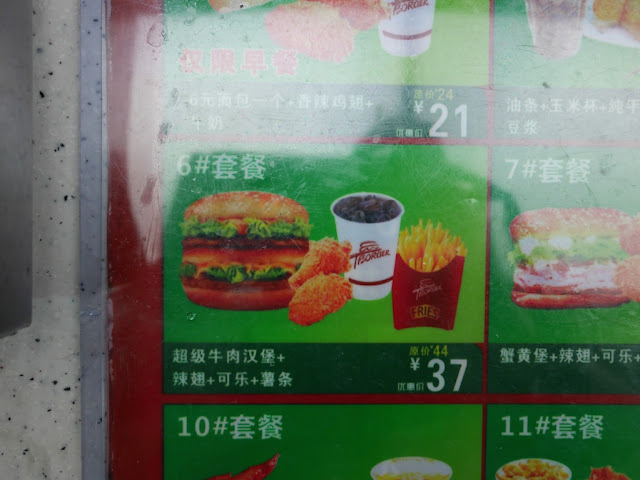 After a proper weighing, 57 yuan (about US $8.25) could strike you as a good deal. 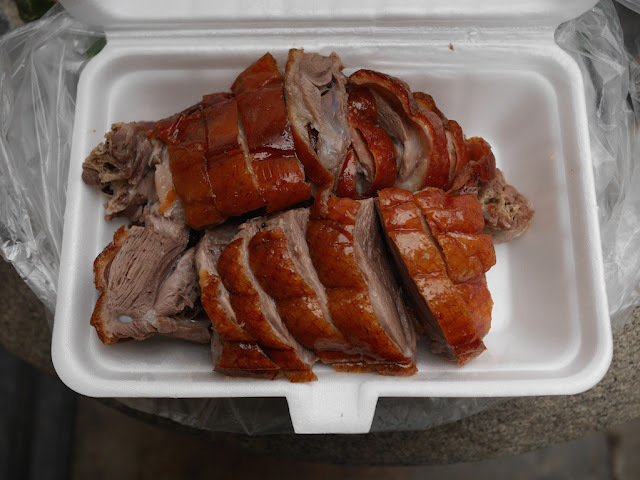 After accepting, they will chop up the portion of goose and toss in some goose neck. And then you will have yourself a pile of goose. Packets of two different sauces will come along for the ride. 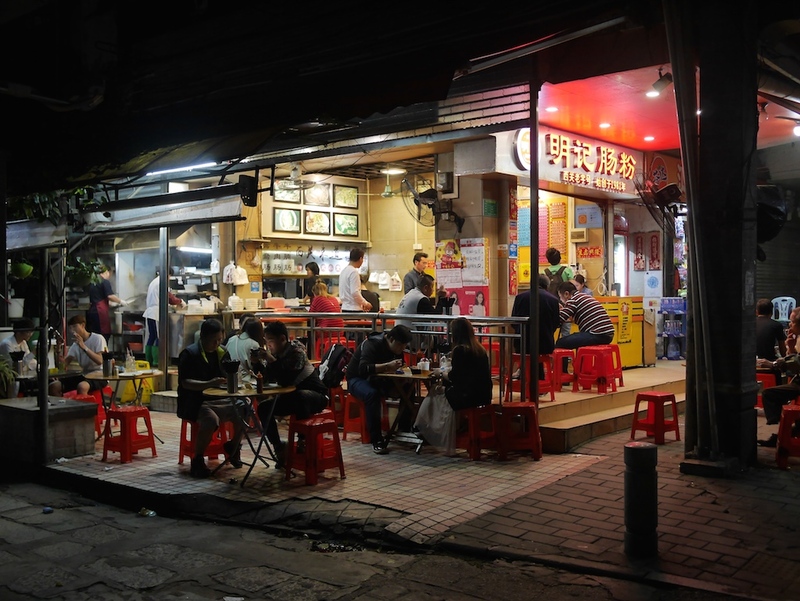 According to some positive online reviews in Chinese you may later discover, the food has an "old Guangzhou" taste. According to a nameless American who still feels full at this moment, the goose is totally worth it. "Great stuff," he says eloquently. 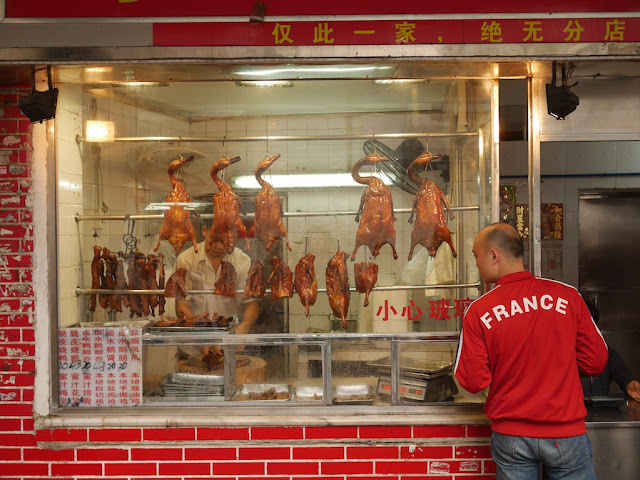 Some other day I will share another goose experience from Guangdong province — in a place where neither the food nor the local dialect is Cantonese. Some other day I will share another line experience in Guangzhou. The lines were much longer and no meat was involved. A rather unexpected dairy product did make an appearance though. Thanks to a friend in the U.S., on Saturday I saw a video from NPR of traditional Chinese sugar painting at the Kennedy Center in Washington, D.C. The video, at least in part, is worth watching if you haven't seen sugar painting before. And even if you are familiar with the practice you may find it soothing to watch, for example after having read a lot of political news and commentary. 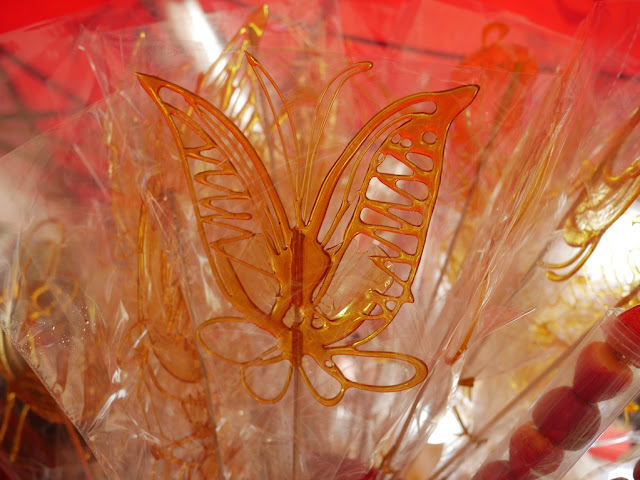 I told my friend I have seen people sugar painting set up on the sidewalk or at street markets. I debated over the right word for describing how often I see it, but it seemed fitting that the very next day at a popular pedestrian street in Zhongshan I saw a booth selling a variety of sugar painted figures. Typically I see less formal setups for the sugar painting. When I stopped by the sugar painter was off doing whatever sugar painters do when they aren't sugar painting — so no video from me. All of the figures, presumably with the exception of a large fish on display, were 10 yuan each (about US $1.46). I have seen more elaborate figures made by sugar painters elsewhere, and perhaps this sugar painter would do something in that spirit on request. Whatever the case, this is just one of the many examples of sugar painting I have come across while going from one city to another in China. 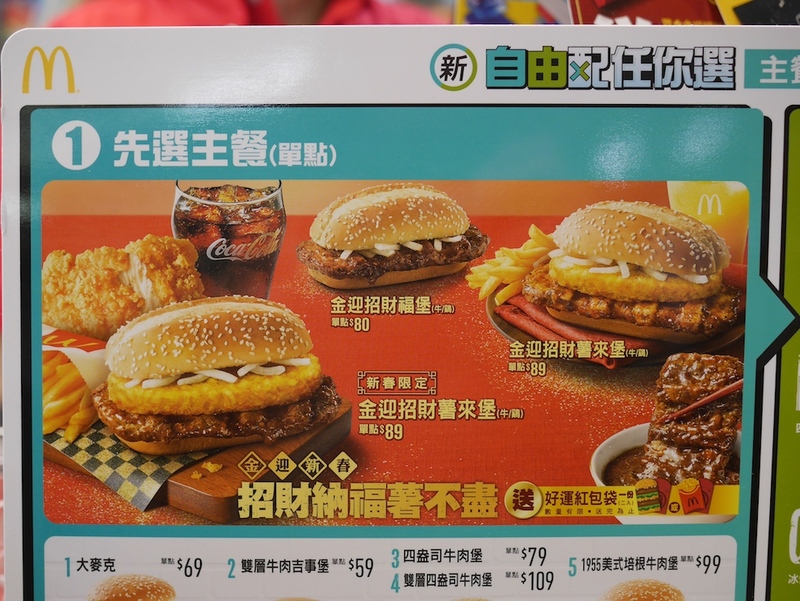 The Lunar New Year in China not only brings a change of zodiac symbols, it also brings the McDonald's Prosperity Burger. 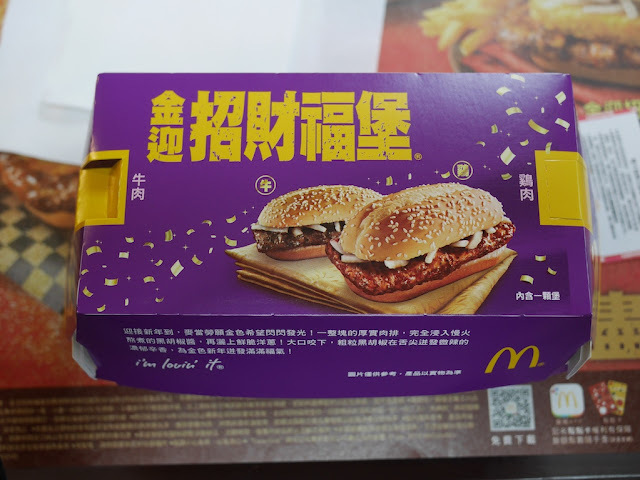 Although available in Hong Kong and Macau, this special holiday treat mystifyingly remains unavailable at McDonald's in mainland China. This year I found myself in Macau at the right time. 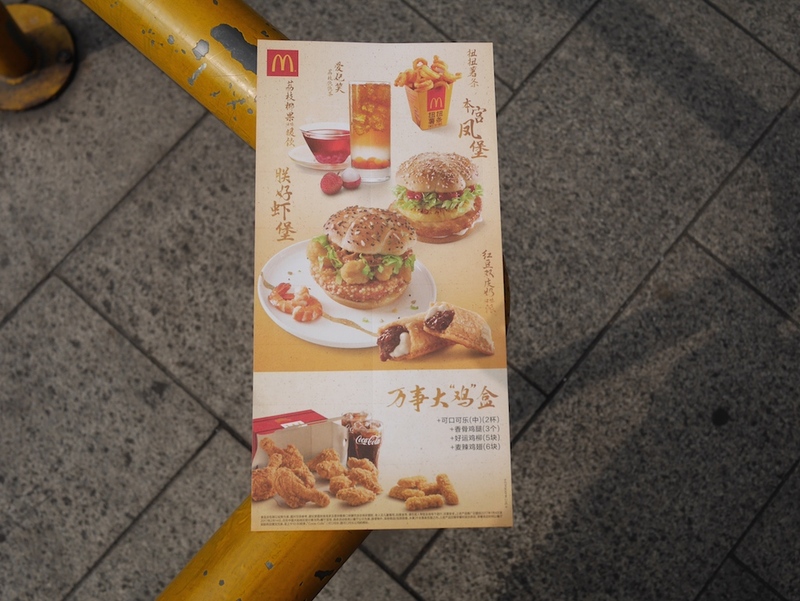 Normally the idea of eating at McDonald's in Macau, a city with wonderful Macanese and Portuguese delights, would seem sacrilegious. I made an exception this time, though I didn't give up a meal for it. Instead, I took one for the team and had two dinners one night. You're welcome. 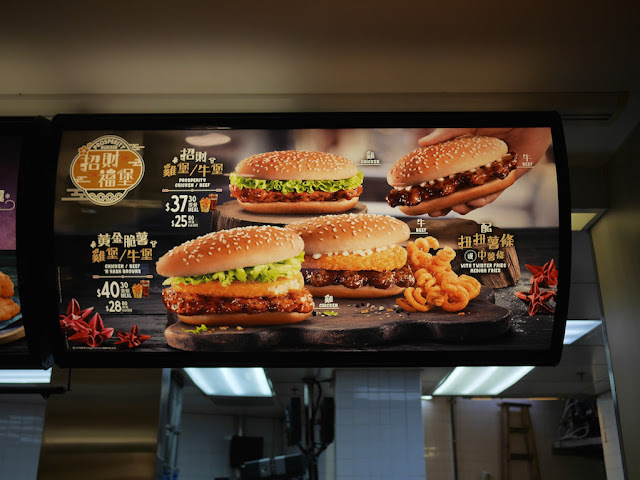 Upon entering the Macanese McDonald's, I saw there were four Prosperity Burger options — a choice of beef or chicken and with or without a hash brown. Curious to try something new, I went with the chicken & hash brown option. It only took me one bite before asking "Why?" The addition of a hash brown wasn't disastrous, but it also didn't do much for the burger except add intense caloric mass while diluting the taste of the Prosperity Sauce. It struck me as an uninspired way to try to mix things up. Next time, I am definitely going for an option sans hash brown. It will have to wait until next year though. But that's not the end to this new year burger story. Not even close. 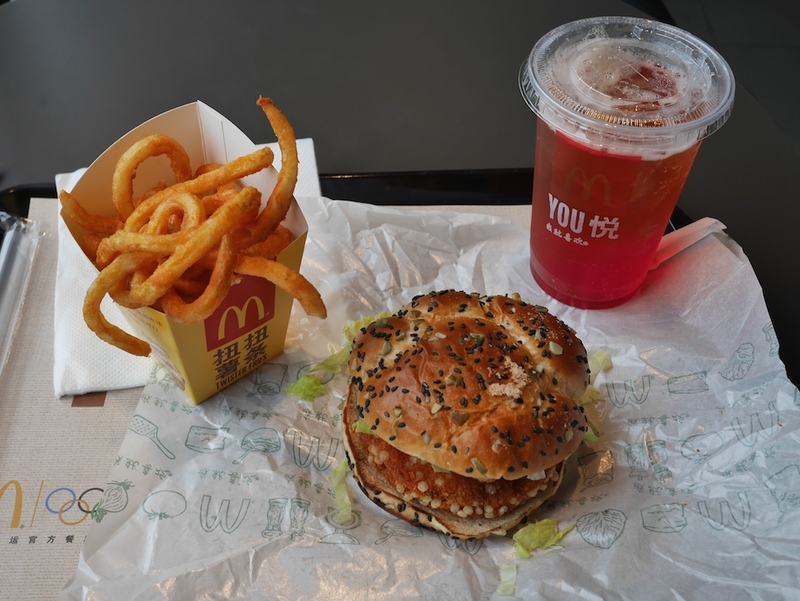 McDonald's China just introduced intriguing new products for Chinese New Year: the Emperor's Best Shrimp Burger, the Empress' Pineapple Burger and a beverage that translates, loosely, as Smiling Concubine's Lychee Bubble Tea. Names like that beg for an explanation. 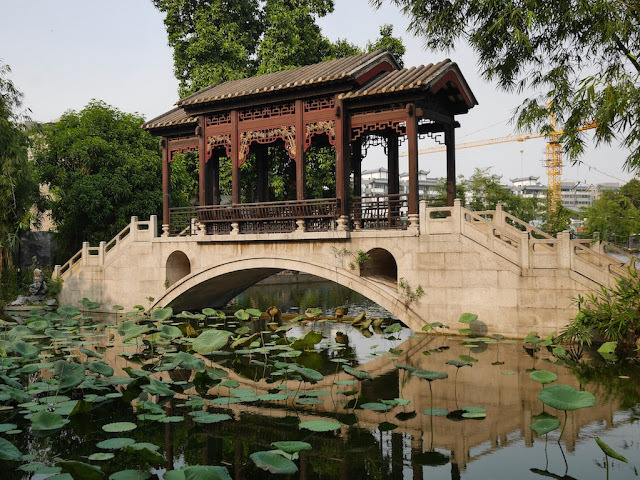 To build buzz about the unexpected ingredients, a campaign from Leo Burnett Shanghai tapped into China's passion for historical TV costume dramas. The shows, such as "The Empress of China," starring actress Fan Bingbing, feature elaborate costumes, tales of love and palace intrigue. Playing on that pop culture phenomenon, the agency did a series of surprising cartoon ads with a historical theme, which rolled out on digital channels including ubiquitous mobile app WeChat. It can be dicey for Western brands to be too literal when referring to Chinese culture, but this approach works because . . .
Read Doland's piece for her thoughts on the promotion's effectiveness and the story behind it. 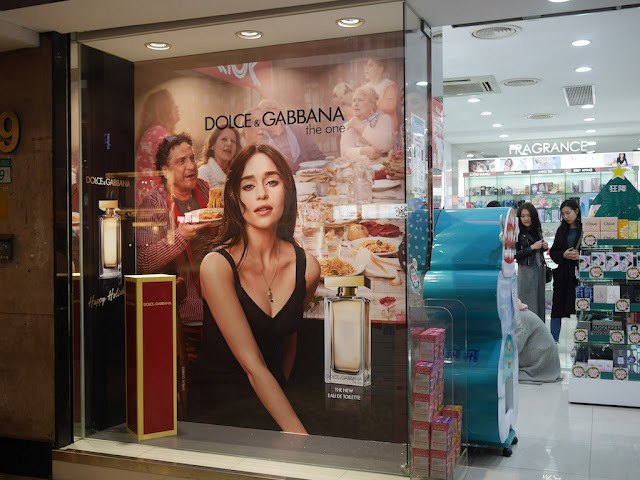 Campaign Brief Asia has a review of three videos which were part of the promotion. Although I was excited to try the two burger, I ran into an unexpected problem. Many McDonald's I checked didn't have either of the burgers. A couple of days ago at a McDonald's in Zhongshan with only the shrimp burger, an employee handing out flyers featuring the burgers told me they had sold out of the chicken burger at least half a month ago. And another McDonald's confirmed their lack of the items was due to selling out. Regardless of the difficulty of finding the burgers, street-side advertisements for them are still easy to find in Zhongshan. I don't know whether this McDonald's promotion was wildly successful or they only prepared a very minimal number of burgers, but either way there a bit of a problem here. I never did find anywhere still serving the chicken pineapple burger, but one recent day in Zhongshan I sat down for the shrimp burger set meal. The curly fries must have been sitting out for a bit and were room temperature. If you imagine sugar stuffed into sugar with lychee flavoring in water, then you have an idea of the lychee bubble tea. And the burger . 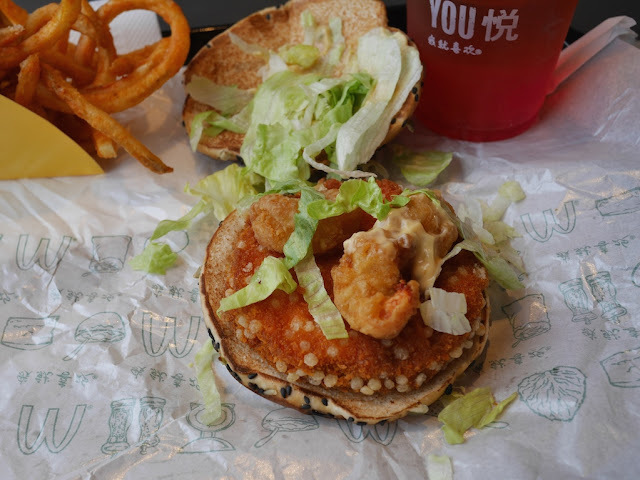 . .
A deep-fried shrimp patty topped with deep-fried shrimp is a bit more deep-fried than I would usually go, but I must say it was decent and reasonably shrimpy. I wouldn't need to do it again, but I'm glad I tried it. I would put it above the chicken hash brown Prosperity Burger but not the original Prosperity Burger. 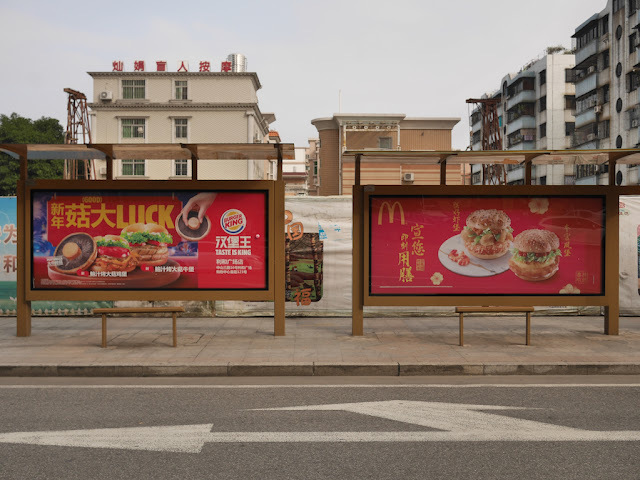 That is all I have for McDonald's, but Steven Schwankert had better luck than I did and reviewed both mainland China burgers for The Beijinger along with explaining the puns in their Chinese names. But we're still not done, because Burger King is in the new year burger action too with two portobello mushroom burgers. 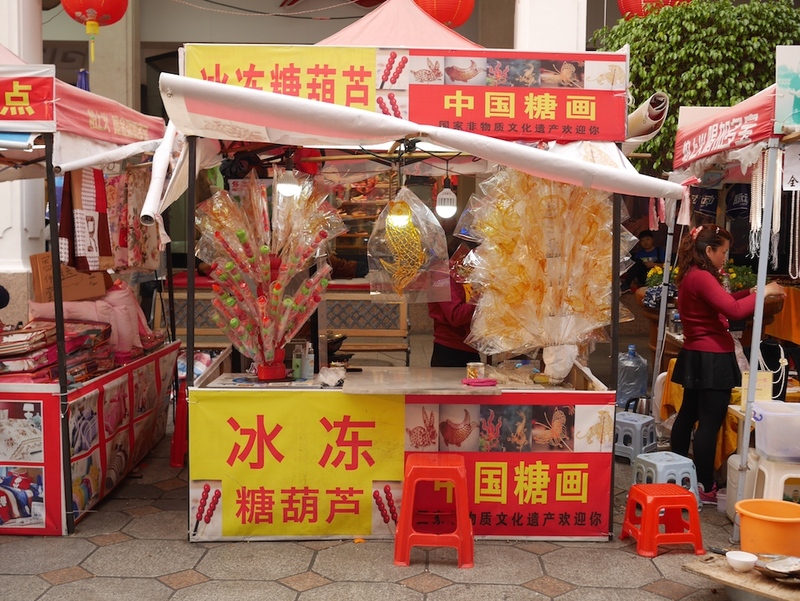 The promotion includes the mixed-language pun "菇大 Luck". "菇" means "mushroom". "大" means "big". And together their sound "gūdà" roughly sounds like the English word "good". In case people who know a bit of English miss the pun, Burger King helpfully puts "good" in parentheses above the relevant Chinese characters. On some signs Burger King provides the English names "Grilled Portobello Chicken Burger" and "Grilled Portobello Beef Burger". 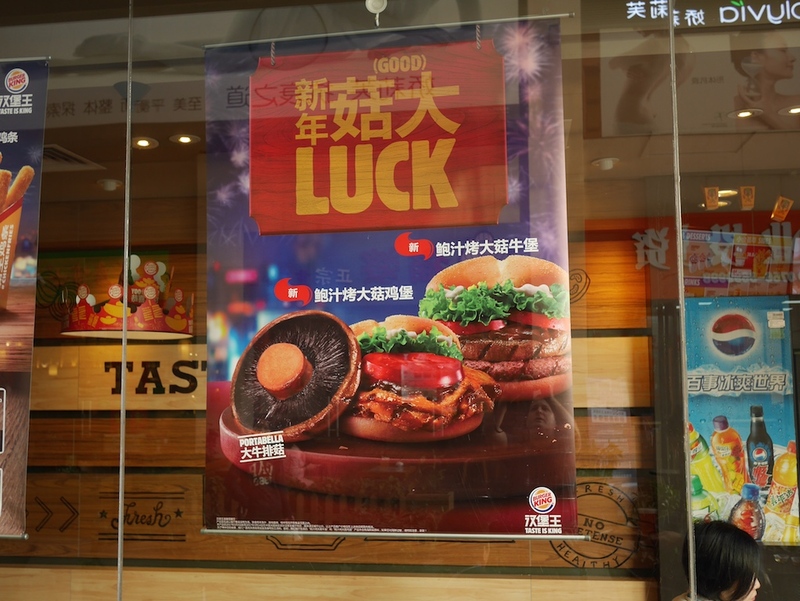 But I am going to go with "(Good) Luck Burgers". With that out of the way . . . 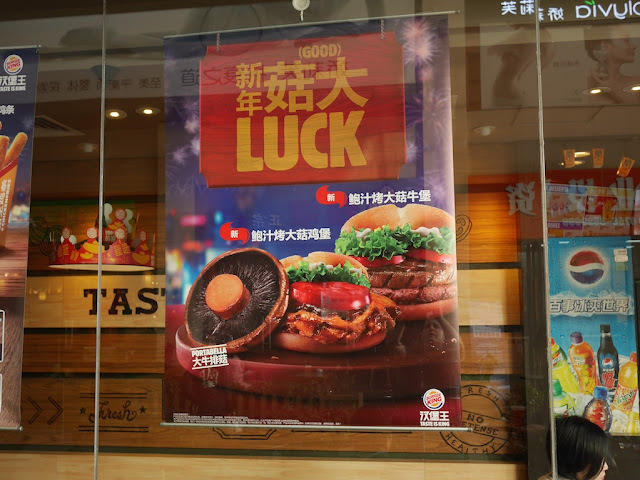 In Zhuhai I met my first (Good) Luck Chicken Burger. A look inside revealed two tomato slices along with the other ingredients. Folks, this was one of the best fast food sandwiches I have ever had. Honestly, I was rather surprised. The portobello mushroom wasn't huge, but it was hearty and complemented the grilled chicken well. This is a burger I would happily eat again. 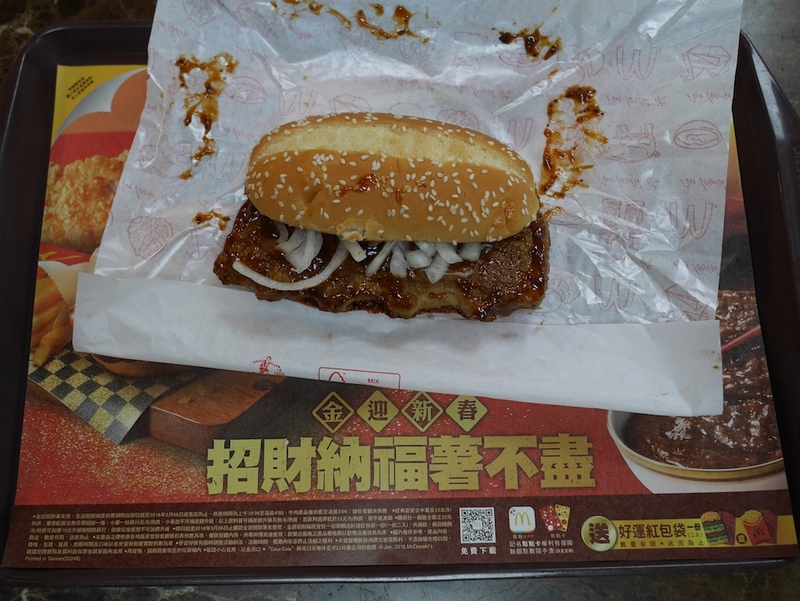 So later at a Burger King in Zhongshan, I figured I had to give the (Good) Luck Beef Burger a try. 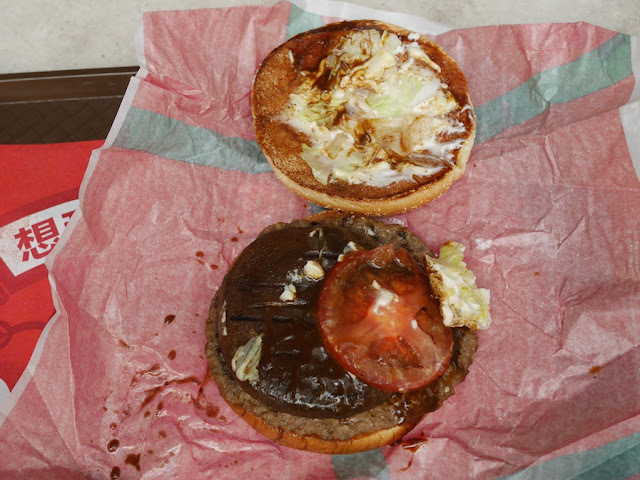 After opening up the burger, I realized my experience this time might differ. There was only one tomato slice this time — a travesty. The positioning suggested another was to be added but for whatever reason it didn't happen. Also, the mushroom was significantly smaller than the meat patty. I found myself less thrilled by this burger. Not only did it have the previously mentioned deficits, but I found the beef and mushroom mix to be less enthralling, though not displeasing, to my tastebuds. I am not sure what to make of that since I enjoy beef and mushrooms together in other dishes. 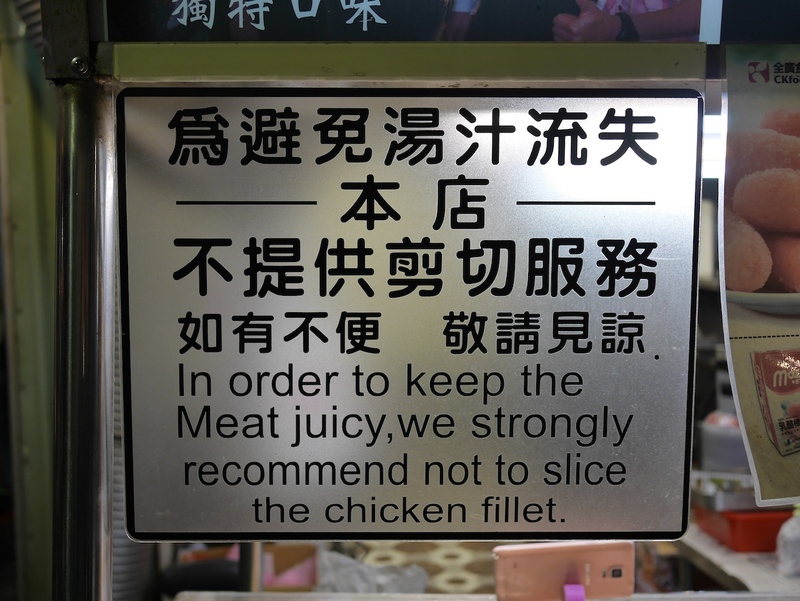 Anyway, I would definitely go with the chicken version next time. Hopefully they don't cheat me on the tomato slices again. 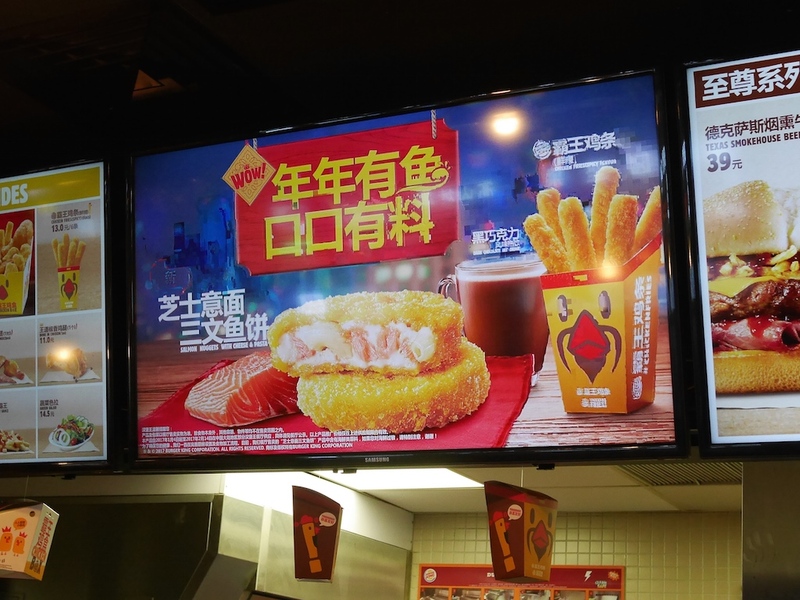 Burger King has other special items available for the new year, such as their Salmon Nuggets with Cheese & Pasta. It isn't something I would expect from Burger King but intriguing. I felt I had dedicated enough of my meals to fast food for this year's holiday though. 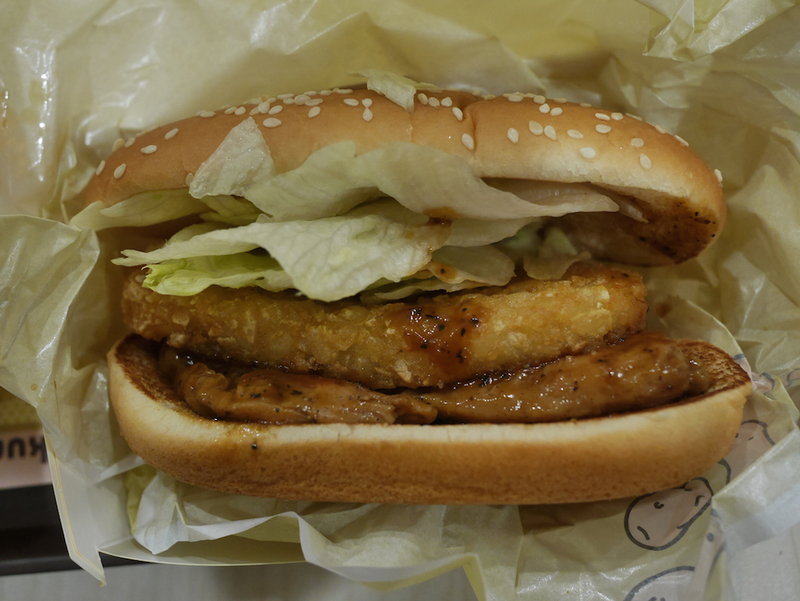 So to wrap up, the (Good) Luck Chicken Burger won this year's fast food Lunar New Year burger prize for me. And all of the burgers far surpassed the Year of Fortune Burger and Year of Luck Burger I subjected myself to two years ago at McDonald's in Chongqing. Kudos to McDonald's for not bringing them back this year. Somehow I missed out on a good old regular Prosperity Burger this year, but I take consolation in having enjoyed some portobellos.